Each Thursday, Emily Vikre (a.k.a fiveandspice) will be sharing a new way to love breakfast -- because breakfast isn't just the most important meal of the day. It's also the most awesome. 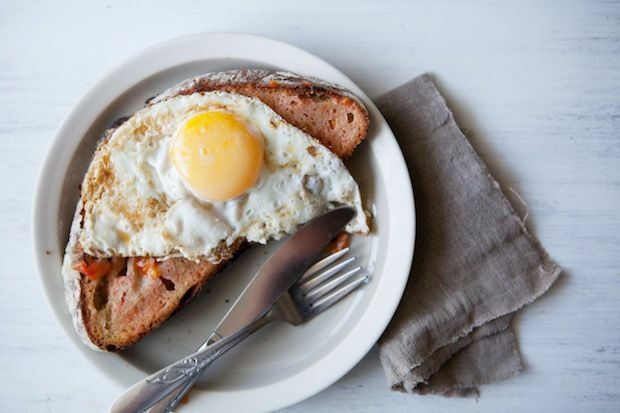 Today: A new way to eat fried eggs, while the season lasts. Growing tomatoes in Northern Minnesota is a dicey business. You can start your seedlings at the same time as everyone else, but chances are you won’t be able to put them into the ground until June. Then they’ll limp through the month, waiting for the temperature to climb into the 70s. In July and August they’ll finally get to bask in some 80-degree days, maybe even close to one week near or in the 90s. Maybe. By the time August is over, in your typical summer, you’ll have a whole lot of green tomatoes sporting a faint blush of red. Then you have to pray that September will be warm enough to tip them over the edge into ripeness. Your average September night, however, is likely to get down toward freezing fairly early in the month and leave you with more green tomatoes than you quite know what to do with. We were lucky enough -- in the context of tomatoes at least -- to have had unusually hot weather the last two weeks, meaning that as everyone else seems to be savoring their last late season tomatoes, we’re entering the feeding frenzy of our “early” season tomatoes. So we’re following the “It’s finally tomato season!” playbook, slicing them thickly to eat with nothing but salt, layering them into sandwiches with mayonnaise, and rubbing them along with some garlic onto hearty slabs of toast. It was the latter that I made for myself for breakfast the other morning. 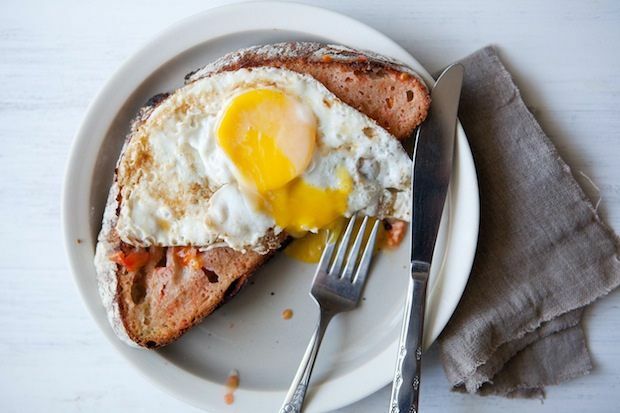 Because it was breakfast, I decided to garnish my pan con tomate with an egg for a little extra heft, and suddenly a whole new favorite way of eating a fried egg on toast was born. Well, at least for as long as our short little season lasts. I like to say I'm a lazy iron chef (I just cook with what I have around), renegade nutritionist, food policy wonk, and inveterate butter and cream enthusiast! My husband and I own a craft distillery in Northern Minnesota called Vikre Distillery (www.vikredistillery.com), where I claimed the title, "arbiter of taste." I also have a doctorate in food policy, for which I studied the changes in diet and health of new immigrants after they come to the United States. I myself am a Norwegian-American dual citizen. So I have a lot of Scandinavian pride, which especially shines through in my cooking on special holidays. Beyond loving all facets of food, I'm a Renaissance woman (translation: bad at focusing), dabbling in a variety of artistic and scientific endeavors.